Indonesia is a collection of 13,466 islands in the Southeast Asia region. Indonesia's neighbouring countries are Malaysia to the north, Papua New Guinea to the east, as well as Singapore and the Philippines. Java is the most populous of all the islands, and the country as a whole is expected to have a population of 321 million by 2050. There are six recognised religions in Indonesia, these being Islam, Protestantism, Roman Catholicism, Hinduism, Buddhism and Confucianism. There are also more than 300 ethnic groups across the islands of Indonesia, each with their own cultural identity that has developed over the centuries. 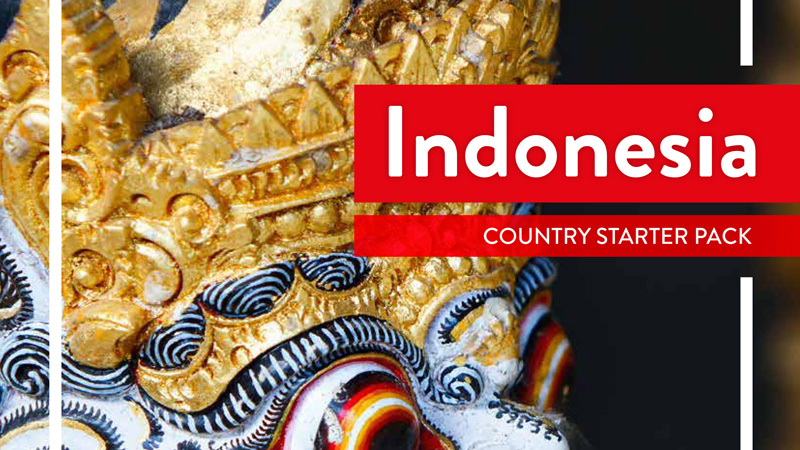 The most dominant influences on Indonesian culture and history are from India and China. These influences have created a diverse and culturally rich nation in Indonesia, with incredible foods, arts and textiles. Indonesia is the largest economy in the South-East Asia region with an estimated gross product of US$928 billion. According to 2011 data, Indonesia is also the world's 10th-largest economy based on GDP statistics. Indonesia is one of Australia's most important bilateral relationships and we have a long standing history of cooperation regarding international and regional issues, and both countries participate in forums such as the G20, East Asia Summit and APEC. Indonesia is Australia's 12th-largest trading partner, with AUD$2.5 billion of crude petroleum exports and AUD$788 millioln of gold exports. Indonesia is also Australia's third-largest agricultural market, with our main exports being wheat, cotton, live animals and sugar.